Designed as the winter edition of Pirelli's very successful Chrono range, the Pirelli Chrono winter is the perfect complement and provides extreme levels of traction and grip in the toughest of winter conditions. 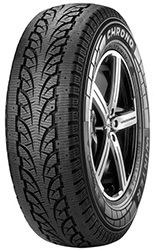 with handling and braking remaining completely un compromised on snow or ice and a directional tread pattern designed to ensure rapid water dispersal, the Pirelli Chrono Winter edition is the tyre to keep you going. If you're looking for a high level of resistance to aquaplaning and don't want to be stopped this winter then make sure you fit your van or commercial vehicle with the Pirelli Chrono Winter edition tyres.